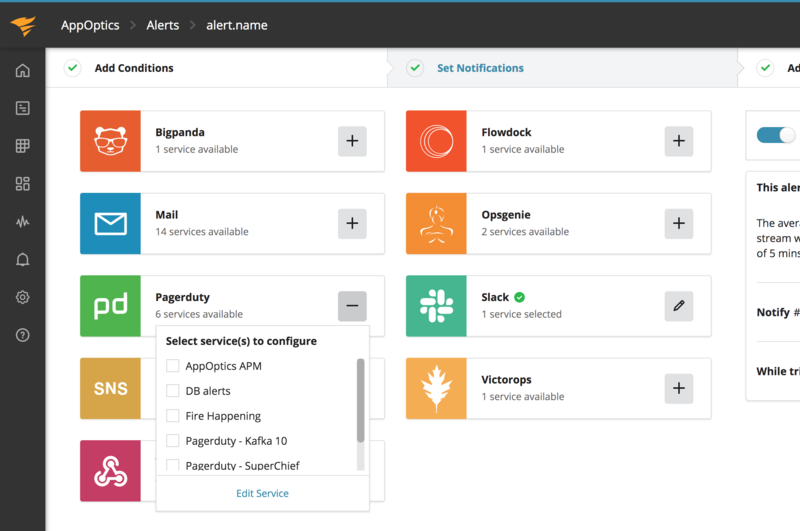 With PagerDuty, you can receive alerts via phone call, SMS and email, set up automatic escalation of alerts and set up on-call duty scheduling for your ops teams. To add a service in PagerDuty, click on the ‘Services’ tab. Then click on Add New Service. Enter a name for the service and select an escalation policy. Select “AppOptics” for the Integration Type. Click on the “Add Service” button at the bottom of the page. Once the service is created, you’ll be taken to the Service Details page. 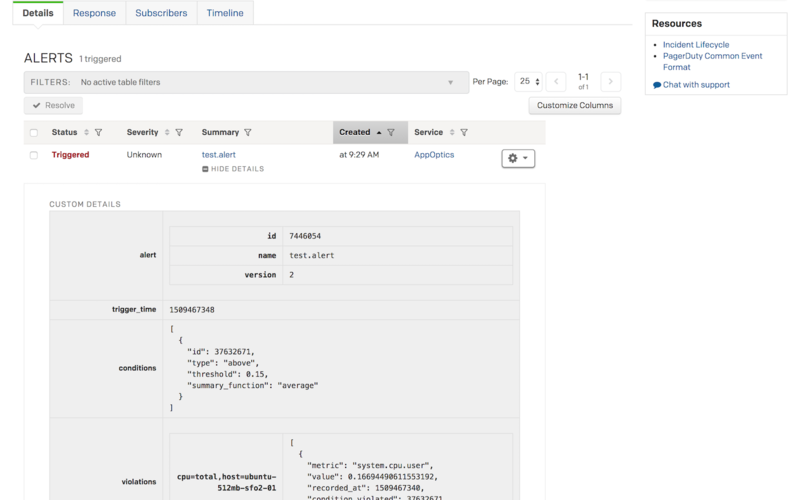 On this page, you’ll see the Integration API Key, which you will need when you configure your AppOptics account to send events to PagerDuty. With your PagerDuty information in hand, navigate to the “Notification Services” section of your “Organization Details” page. 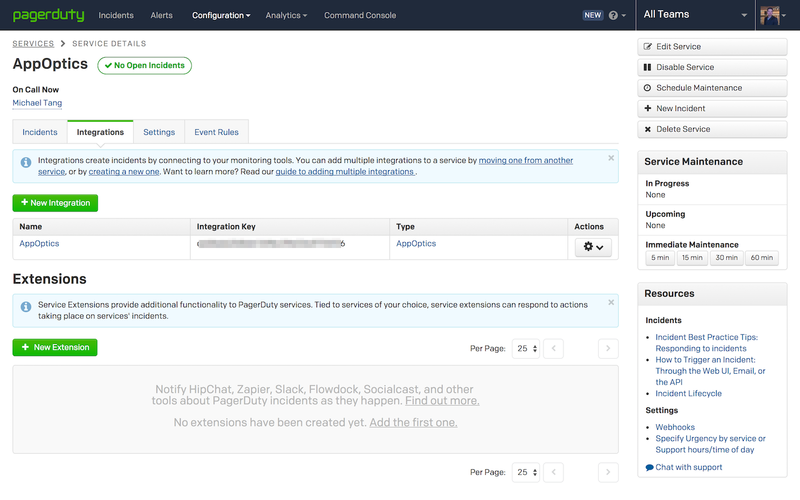 Click on the PagerDuty integration, then on the “Add Configuration” button. Title: Service destination name, for example Pagerduty hook . Service Key: The Service API Key you copied from the PagerDuty services page (REQUIRED). Description: A short description of the problem that led to this trigger. This field (or a truncated version) will be used when generating phone calls, SMS messages and alert emails. 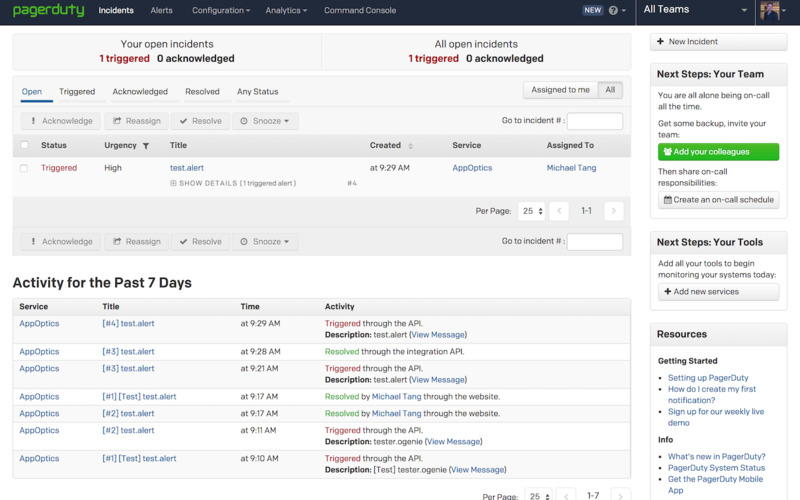 It will also appear on the incidents tables in the PagerDuty UI (REQUIRED). Incident Key: Identifies the incident to which this trigger event should be applied. If there’s no open (i.e. unresolved) incident with this key, a new one will be created. If there’s already an open incident with a matching key, this event will be appended to that incident’s log. The event key provides an easy way to de-dup problem reports. If this field isn’t provided, PagerDuty will automatically open a new incident with a unique key (OPTIONAL). After setting up the service you can tie alerts to a service destination. You can read more about creating alerts in the Alerts knowledge base article. 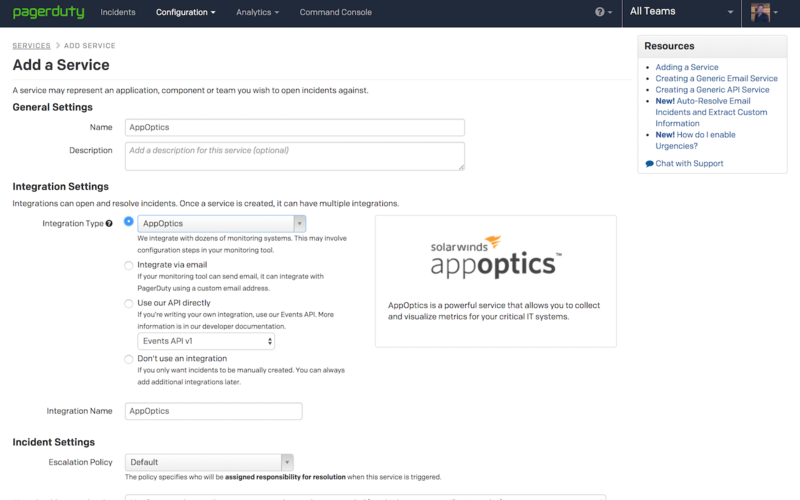 You can easily set up AppOptics to work with multiple PagerDuty service destinations. When an alert fires the payload is sent to PagerDuty.